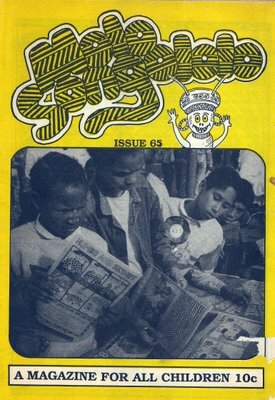 Molo Songololo: This children&#039;s magazine started as part of the anti-Apartheid struggle in South Africa. CHAIRPERSON: Can I ask the audience please to take up their seats as quickly as possible so that we can proceed. Brian and Weaam, welcome here today. Thank you very much for being here to make this submission which will help us understand the effects of apartheid on the children of South Africa. I am now going to hand over to you and allow you to present your submission. MR CLAASSEN: Hi, my name is Brian Claassen. I am representing Molo Songololo. First I would like to tell you a bit about myself. I am living in Mitchells Plain on the Cape Flats and I was fortunate enough to attend one of the few schools, special schools, for children with cerebral palsy and it is through my association with the school that I became with Molo at the age of 15 and I am here to represent the children. It is in keeping with one of the aims and objectives of Molo Songololo of creating a space for children to speak for themselves that we, me and Weaam, have volunteered our services to research, write up and present this submission. MS WILLIAMS: My name is Weaam Williams. I was first exposed to Molo Songololo when I was about nine years old. The magazine significantly contributed to my development as a child. It made me realise my rights as a child and the equality of all children. I am proud to be here today representing Molo Songololo. Most of the Truth Commission's hearings, thus far, has focused on individual cases. As a children's organisation, Molo Songololo feels obliged to make a representation on behalf of the majority of South Africa's children. The main focus of the Truth Commission up until now has been the overt killing, torture and severe ill-treatment of people either to uphold or breakdown the system of apartheid. We pay tribute to all children suffering in this regard. However, the violation of children's human rights extends beyond physical forms of violence. During the apartheid era the racial discrimination in itself was an institution dehumanising to the majority of South Africans, especially children. Our submission therefore focuses on the severe ill-treatment of children through the racially discriminative infrastructure of the past regime causing severe mental and emotional trauma resulting in social ills. One of the issues that we are going to be looking at is land. Over 3,5 million people were forcibly removed. The 1913 Land Act led to the formation of african reserve areas called Bantustans. To give credence to the divide and rule idealogy, the Act allowed for indians and coloureds to own land while blacks were denied land ownership. The 1966 Group Areas Act forcibly removed people from their place of birth such as District Six, Elsies River, Claremont, etc. Many were removed from aesthetically superior areas and placed in water-logged and desolate areas such as the Cape Flats. This posed as a great health hazard to many children and exposed them to harsh living conditions. It also determined the inferior quality of life of many families. Since the mid-70's one of the most commonly used legal mechanisms has been the Prevention of Illegal Squatting Act. It granted powers to local authorities and landlords to demolish buildings and unilaterally evict residents without recourse to the courts. The effects that this had on children are the creation of squatter areas with no running water and poor sanitation facilities. This exposed children to harsh living conditions and accompanying health risks; a lace of recreational facilities, once again contributing to a loss of childhood; the forced removals led to a breakdown in family structures causing many children to seek acceptance in gangs and using drugs as mechanisms of escape; the poverty stricken conditions of townships caused many children to end up on the streets, living aimless lives and bearing the brunt of society's degradation; the poorly designed townships impaired children's sense of aesthetics; it also stripped children of their heritage, citizenship and a sense of belonging, causing confusion to their norms and values. Our recommendations are as follows: Effective allocation of land and resources to benefit all children, the continuous upgrading and development of a safe township environment; the creation of safe recreational and sports facilities; the provision of proper and adequate sewerage and sanitation facilities. MR CLAASSEN: The following area that I will be looking at is health. The World Health Organisation defines health as and I quote, "A state of complete physical, mental and social wellbeing, not merely the absence of disease or infirmity". Good health is intrinsic to good living conditions. Poverty renders the majority of children to live in conditions that are not conducive to good health. When living standards drop infant mortality rises and malnutrition grows. The poverty stricken conditions which blacks live under renders them more susceptible to common childhood infections such as diarrhoea, tuberculosis and measles. During the past era these diseases accounted for 85,3% of all deaths related to infectious diseased. The majority of infant of child deaths during the apartheid rule were as a result of the racial fragmentation of health services. For example, according to research for the period 1976 to 1984, the discrepancy between the per capita health expenditure per race per child in American dollars is as follows. A white child in that period received $201,00, an indian child $109,00, a coloured child $111,00, a black child $51,00. The extreme social dislocation produced by apartheid led to the collapse of family and community cohesiveness and provided fertile ground for the spread of sexually transmitted diseases. An example of this would be congenital syphilis. It has been reported that congenital syphilis is a leading cause of perinatal mortality and that in Durban about 100 cases of congenital syphilis are seen yearly in one centre. The effects it had on children. The lack of health services aimed at prevention rather than cure saw many children die prematurely. Children suffered from preventable diseases such as polio which resulted in disability. Malnutrition and substance abuse negatively affected their mental and physical development. Drug dependency became a part of children's lives causing mental and physical ill-health. Our recommendations in this regard are that health should receive priority within the budget allocation; eradication of poverty should be one of the main focuses of primary health care as health cannot be achieved without the raising of living standards; health services should be made accessible and affordable to children up to the age of 18; more and adequate services should be put in place for victims of violence and abuse; a more concerted effort should be made to provide health services for street children and abandoned children. They are most vulnerable to diseases, infections and abuses; primary health care should be the main focus of health services. MS WILLIAMS: The next area I am going to be looking at is education. Education is considered a basic human right and a necessity for productivity. Apartheid education fundamentally violated this right. The provision of education in South Africa followed a pattern of racial inequality that reinforced the political economy of the apartheid order. Further to create racial, class and ethnic inequalities. In relation to this it was a known fact that education was not compulsory for black children. The policy of education for blacks was to direct the majority of black children towards the unskilled labour market. Black pupils were not encouraged and nurtured in technical subjects such as mathematics and science. Little or no emphasis was placed on black teacher training to adequately teach these subjects. This system further deprived the majority of black children of tertiary education by introducing the quota system in white universities. In 1992 Molo Songololo hosted an exchange programme and these are some of the comments of the children. Quote, "Ellerton's building is like a hospital. It differs from our school. There is a swimming pool, a park and an exercise hall. Their library is very large. They have everything our school does not have.". That is by Nigel from Morgenson Primary in Hanover Park. Quote, "my school is different from Government schools. We do not have a pool and the school is made of zinc and it is surrounded by squatter camps. The zinc on the roof is not completely done and we have very little space to study. Ellerton school is fully equipped and clean on the outside.". That is by Joyce from Siphika Community School in Nyanga East. Quote, "Stormande, a community school, is very poor and dirty. The school is overcrowded and the children stood outside to begin their assembly. The children obviously do not learn much due to the shortage of textbooks and the children do not seem to care. Education is important if you need a job and to be respected.". This is by Gizelle from Ellerton Primary in Sea Point. The effects that apartheid education had on children. The statements made by the children mentioned previously clearly indicates inequalities within schools. The fact that white children are academically, athletically and artistically more developed than black children is due to the lack of sporting and art facilities, adequate or no libraries, etc in black schools. The use of indoctrination instilled the belief of white supremacy. Apartheid education also created language barriers which further alienated children from each other. Unemployment amongst black parents forced children to leave school and therefor lose out on education and job opportunities that goes along with it. The lack of special education facilities for children with disabilities reduced such children to burdens of society. Our recommendations are as follows: The creation of adequate educational and recreational facilities in township and rural schools; to provide a meal at these schools as children cannot learn on an empty stomach; all teachers should be qualified and should treat children with patience, dignity and respect. All teachers should be evaluated and monitored to ensure that they are protecting the rights of the child; all children should have the right to participate in the evaluation and upgrading of curriculum that respects all the traditions, values and cultures of children in South Africa; the State should provide multi-cultural teacher training; more and improved centres should be set up for the special educational needs of children with disabilities and street children; all creches, pre-schools, schools and institutions dealing with children should commit themselves to upholding the values of the new Constitution and the South African Children's Rights Charter. MR CLAASSEN: The next section I would like to deal with is the apartheid debt. Paying off apartheid's debt, which currently stands at some R311,0b, legitimates a system that grossly violated human rights. It is the second highest expenditure of the 1997/98 budget. This indicates that the Reconstruction and Development Programme suffers under the weight of interest payments on this debt. It further means that the majority of children who had suffered and fought against apartheid would continue to live in a state of poverty and it would ultimately render their sacrifices futile. It is our submission that, fundamentally, it is morally wrong for the present Government to be responsible for paying off this debt. Our recommendations in this regard are the following: We strongly recommend that the debt be reversed and the money be spent on the reconstruction and development of the country; we further recommend that the Truth Commission investigate the financing of apartheid. Such an investigation would benefit the children in particular as this debt directly impacts on their future survival and development. In conclusion we would like to say the following: The idealogy and infrastructure promoted by the apartheid regime had a detrimental effect on the well-being of children. Not only did it promote shattering prospects of racial and cultural inequalities, but also significantly strategised their alienation. The articulation and creativity are, sorry. The deeply psychological and emotional scars such as hatred, lack of self esteem, articulation and creativity are a direct consequence of a system that disempowered the majority of its people. Molo Songololo foresees the formation of a Children's Council including children to pursue and explore ways in which to ensure children's survival, protection and development. Finally, it is our contention that you cannot speak about reconciliation to someone when he or she does not have a decent place to live or even a morsel of food to eat. Reconciliation is only in the vocabulary of those who can afford it. It is non-existent to a person whose self-respect has been stripped away and poverty is a festering wound that consumes his soul. Thank you very much. MS BURTON: Weaam Williams and Brian Claassen, it is my pleasure to thank you and to commend you for the submission that you have made to us today. I remember well when Molo Songololo was started and many organisations have struggled to change their role, to bring their role up to date, in a way, in our new South Africa and it is very interesting to see how an organisation like this has moved beyond looking after the interests of children in a situation of resistance, to looking at our present day society. So, you can certainly, both of you, as you say, be proud to be associated with it. Your submission to us is very well researched and we really appreciate and value that and you have made clear and detailed recommendations to us and we will take note of those and thank you very much for them. Thank you.